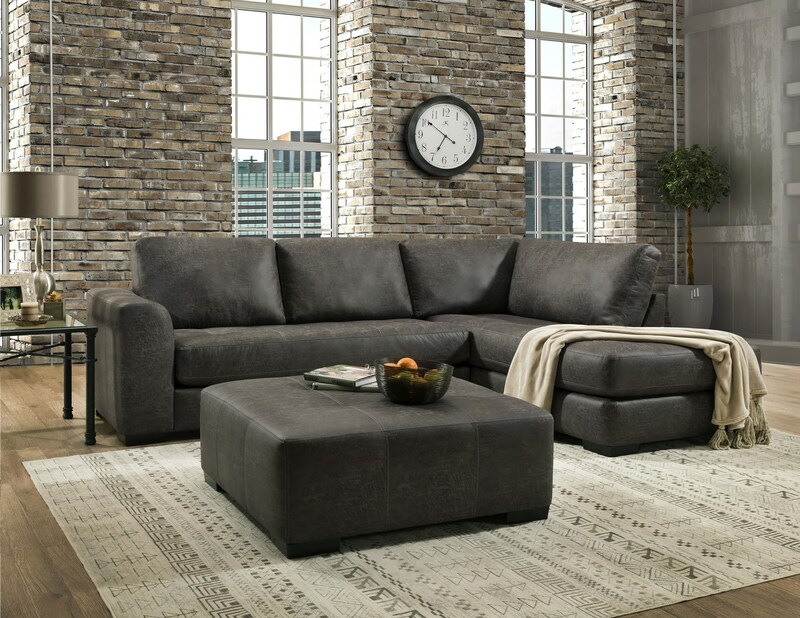 The 275 Two Piece Sectional by Albany at Furniture Fair - North Carolina in the Jacksonville, Greenville, Goldsboro, New Bern, Rocky Mount, Wilmington NC area. Product availability may vary. Contact us for the most current availability on this product. Fabric Options Available in select faux leather options as shown. Frame Construction Hardwood corner blocked with engineered wood frames. All frames are a combination of hardwood, hardwood plywood, and OSB, with all the structural parts being hardwood. All groups have bolted-on arms for a better frame construction. Motion upholstery features removable backs and solid wood inside and outside arms. Seat Support Sinuous, no sag springs made of 8 gauge steel. Padding & Ergonomics Cushions feature 1.8 density foam, wrapped with thick Dacron on both sides for added comfort. Arms are also padded with Dacron. Backs and pillows are filled with a pick fiber Dacron. Warranty Lifetime limited warranty on frames and motion mechanisms. 5-year warranty on springs. 1-year warranty on seat cushions, filling materials, fabrics or leathers, and electrical motors. Add cool, contemporary style to your living room with the 275 group. The sectional sofa with a chaise lounge creates a great place for seating no matter the activity. 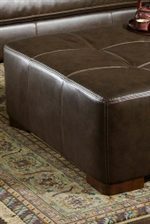 The sophisticated styling features Capri Dark Brown or black upholstery with tufted details on the sectional and cocktail ottoman tops accented by double rows of contrast stitching. Low-profile block feet in a medium wood finish complete the look. The 275 collection is a great option if you are looking for Contemporary furniture in the Jacksonville, Greenville, Goldsboro, New Bern, Rocky Mount, Wilmington NC area.